Solar energy is plentiful as an alternative energy and dye-sensitized solar cell (DSSC) is a promising photovoltaic device that can convert solar energy to electricity for human use. In the past two decades, numerous efforts have been devoted in developing a cost-efficient DSSC with high energy conversion efficiency for real application. 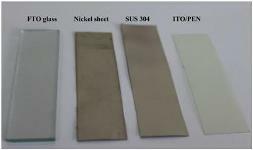 This article reviews relevant research works on the counterelectrode including the materials used as the substrate and catalyst. Different fabrication methods used for preparing different catalysts are also reviewed.